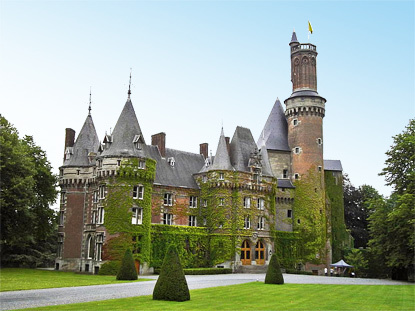 Antoing is one of Belgium most original and well-known castles. It was first mentioned in the 12th century. Although the castle date from the 13th and 15th century, it was redesigned in neo-gothic style in the 19th century by the famous French architect Viollet-le-Duc (1814-1879), who also worked on such places as Carcassonne or Pierrefonds Castle in France. Other Belgian castles built in this style include Faulx-les-Tombes Castle and La Posterie Castle in Courrière, both about 15km south of Namur. The castle of Antoing first belonged to the powerful Melun family, then passed in 1634 to the Princes de Ligne by inheritance. The Ligne family also owns the magnificient castle of Beloeil in the same province. The castle is open in the afternoon only on Sundays and holidays (or Thursdays, on demand) from 15 May to 30 September. Visits are possible only with guided tours at 3:00 pm or 4:00 pm. Entry is 3 € for adults and 2.50 € for children. The town of Antoing is a few kilometers south of Tournai, near the French border. By train, Antoing is only 5 min from Tournai or 32min from Mons. From Brussels or elsewhere, you should first go to Mons or Tournai then change train for Antoing. By car, take the E42, N52 or N507 and exit at Antoing.